It was not until 1943 that zoologist Rudolph Martin Anderson identified the Bernard's Wolf, also known as the Banks Island Wolf, as the subspecies Canis lupus bernardi. An adult male skin and skull of the wolf at the National Museum of Canada had been collected by Peter Bernard. The wolf was named after hunter/explorer/fur trader Peter Bernard and his nephew Joseph Bernard. The Bernard's Wolves reside on Banks Island in the Northwest Territories of Canada. They were previously widespread in the archipelago Victoria, but were annihilated by excessive hunting. 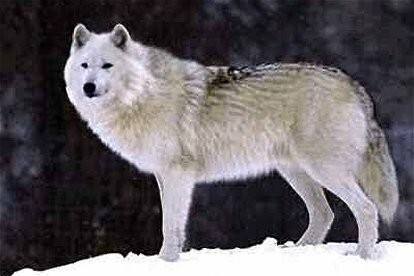 They are large wolves, standing up to 4 feet tall and 6 feet long from tip of nose to end of tail. They have long thick white hair with a black stripe down their spine. They can weigh anywhere from 60 to 110 pounds. The last Bernard's Wolves seen on Banks Island were in the northwestern regions. During a survey of the southern region of the island taken in March of 1993, no wolves were found, nor were any fresh wolf kills nor wolf tracks seen. The wolves on Victoria Island were killed off between 1918 and 1952.